During the 1900's, Taiko drumming became a musical art form that involved a music ensemble and tightly choreographed movements. This is taiko as we know it today. One of taiko's most defining aspects is it's dynamic playing style. Taiko playing is loud, hard, and fast, and involves a lot of choreographed movement which many identify with Japanese martial arts. There are more than 8,000 taiko groups in Japan, but it is only over the last 30 years that taiko drumming has taken root in the western world. 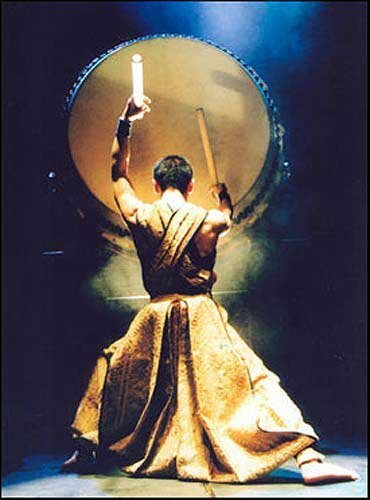 Even if you have not seen taiko drumming live, you have probably still encountered it in movies with a Japanese theme, such as Rising Sun, or The Hunted. Through these four principles we hope to achieve what we call the ultimate expression of taiko, when the art becomes a part of our personality, a way of being and life expression. The first principle 'attitude' refers to having a respect for one's self, other players, and the instruments in order to bring about a discipline of both body and mind. As taiko drumming is a form of ensemble drumming that has strictly choreographed movements, it is crucial that the performers develop an awareness of their body movement in space and their interaction with other players. Every group has its own distinctive songs and playing style. For a brief introduction to Tamashii's style, see our videos . Learn more about taiko from Wikipedia. A good Google search will turn up some interesting references. Here is one good reference from Tucson Taiko. First and foremost, it's important to understand that although taiko drumming is a form of music, it's probably unlike any other kind of music in the world. In many taiko styles (including Tamashii's), movement is just as important as rhythm, so in our view, taiko can be thought of as 50% dance and 50% music. Taiko movements also tend to be hard and fast, and generally very tiring. This means that to perform taiko well, you will want to be in good shape and develop speed and endurance -- much like martial art training. Any kind of training requires a massive amount of hard work. The highest-level professional groups in Japan have very intense physical exercise regimens to complement their music and dance training. But don't let these observations deter you; basic taiko drumming is suitable for all ages, skill levels, and fitness levels -- even kids! Join us at one of our upcoming classes to try it for yourself!